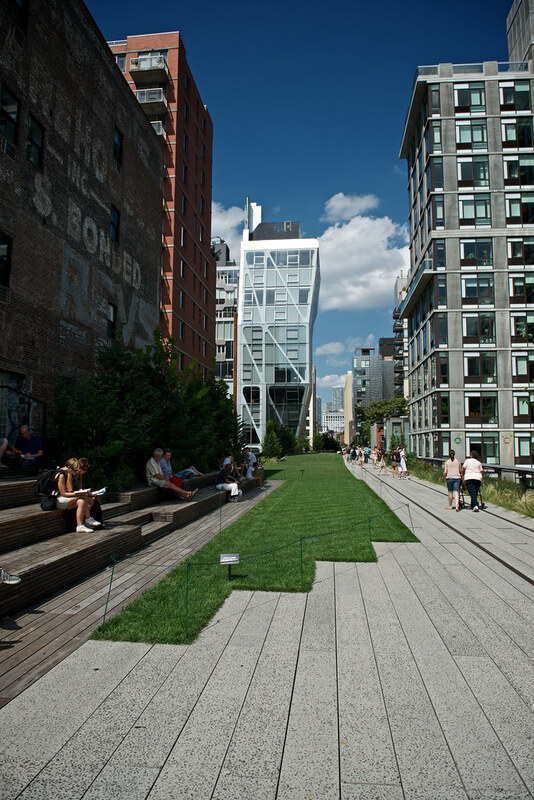 One of the more popular additions to the Westside in recent years has been the High Line Park. For years an abandoned elevated railroad ran long 10th avenue from from about 14th street all the way up to 34th. During the past decade, celebrity activists, park-goers and other interested citizens raised the money and awareness to convert the railroad to an elevated pedestrian park. Today the High Line is nearly complete, and is a terrific walk from the Meat Packing District up through Chelsea and on to Hell's Kitchen. Thursday I met Jessica for lunch at Pastis, then walked back along the High Line to 26th street. The most notable landmark on the High Line's southern end is the Standard Hotel which straddles the park. We actually stayed at this hotel right as it opened. Its notable for its many bars and restaurants, and for the high likelihood of seeing naked people in the windows overlooking the park. Not so today. When the park first opened, the greenery was pretty new and sparse. Much of the old railway still exists, but mostly for show. In recent years the plants have thrived, and in some places, nearly overwhelm the walkway. Moving north through Chelsea, there are terrific west-to-east views of the City. I've taken this picture before. Most of the park's food vendors are around 16th street. San Francisco coffee favorite Blue Bottle has a kiosk selling fresh-made coffee, beans and their famous New Orleans Iced Coffee, perfect for a hot summer day. Further north, some of the spaces are a bit more eclectic, like this viewing auditorium looking north up 10th avenue. There's not really much to see, but a good place to sit in the sun. Architecture buffs plan walking tours along the park as there are many notable buildings to see. Some of the narrower parts of the park get a claustrophobic with the thick greenery. It is a park, after all. Many condo buildings have sprung up along the High Line. The walkway looks directly into bedrooms and living rooms. New York is one of those rare places where a manicured grass lawn is exhibited as a museum piece. Don't dare try to walk on it, though. The Park Police will descend in moments. Of course, be sure to bring a nice camera.